The market has remained relatively thin when it comes to solid-state drives (SSDs), but there is certainly a consumer interest in this alternative type of storage. G-Technology has unveiled a new line of portable external SSDs that offer improved reliability and read speeds over magnetic-based drives. Unfortunately, the steep price per gigabyte of this new technology puts the G-RAID mini2 SSD out of the reach of most consumers. By giving you the choice of configuring the two-drive device as either a speedy RAID 0 or a mirrored RAID 1 drive, the G-RAID mini2 SSD attempts to offer an alternative for speed-focused consumers and professionals who need a safe place to store critical photos, video, and music. The RAID 1 data mirroring is ideal for professional camera junkies who want to offload footage onto a redundant storage system. Like every product in G-Technology’s lineup, the G-RAID mini2 SSD is built tough, comes with a three-year warranty, and is targeted to professionals and higher-end consumers. Throwing down about $2,500 for 512GB of storage space isn’t in the average consumer’s budget, but professionals will likely find SSD’s rock-solid reliability attractive. The press materials indicate that the drive has a g-force rating of up to 1,500, and, compared to a magnetic hard drive, is less likely to fail while reading data. The G-RAID mini2 SSD features eSATA, FireWire 800, FireWire 400, and USB 2.0 connections. 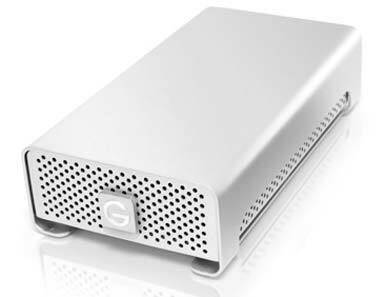 G-Technology generally makes sturdy, monolithic aluminum-case drives, and the G-RAID mini2 SSD is no exception. It’s a couple of inches longer and wider than an iPhone and three times as thick. Though it’s by no means the lightest portable drive out there, you can fit it in a backpack for travel use. The drive can draw power from the FireWire bus, but requires the use of an external power source for USB and eSATA connections. An integrated heat-sink and quiet-cooling fan ensure the drive runs relatively quietly and coolly. SSDs have several advantages. They offer faster startup than a hard drive because they don’t have to spin up. They’re typically faster for random-access reading, since they don’t have to move a read-write head. And they have an almost-constant seek time since no head has to travel to various locations on a platter to read data, as happens with magnetic drives. The lack of moving parts makes an SSD quieter than a hard drive and less likely to suffer mechanical failure. When SSDs do fail, it’s usually due to writing rather than reading errors (which typically afflict magnetic-mechanism drives). Reading failures usually mean you’ve lost the data permanently, while with writing errors the data may be written someplace else and hence recoverable. Of course, SSDs have their drawbacks. They cost considerably more per gigabyte. The G-RAID mini2 SSD is no exception, with a price per gigabyte of $4.88. In contrast, LaCie’s 500GB Little Big Disk Quadra ( ) hard drive currently has a price per gigabyte of 70 cents. As with most SSD drives, the drive’s capacity is adequate for some users, but can’t compete with the 1TB or 2TB in some magnetic drives. SSDs routinely suffer from slow write speeds, but the G-RAID mini2 SSD produced some of the fastest times we’ve seen in an external drive. Using eSATA, the G-RAID mini2 SSD finished our 1GB copy test in 32 seconds, 2 seconds faster than LaCie’s Little Big Disk Quadra 500GB—though not statistically significant, it still puts the G-RAID on par with some of the fastest drives we’ve tested. Since writing is an SSD’s weakness and our copy test is a pure writing test, the G-RAID’s success here is very impressive. The second test we run on our external drives is a 1GB duplication test, which is a combination of reading and writing. Using eSATA, the G-RAID mini2 SSD finished the test at a speedy 28 seconds, almost twice as fast as the 50 seconds posted by the Little Big Disk. The FireWire 800, FireWire 400, and USB 2.0 results were similarly faster on the G-RAID mini2 SSD than on the Little Big Disk. Our third test, a low-memory Photoshop suite, uses the external drive as a scratch disk and runs a regimen of four tasks. The G-RAID mini2 SSD shined in these tests, regularly beating out its magnetic cousins by staggering margins. G-Technology’s G-RAID mini 200GB ( ), a magnetic-based precursor to the G-RAID mini2 SSD, was 50 percent slower using its FireWire 800 connection in our low-memory Photoshop tests. The Little Big Disk didn’t fair any better; the best times the Little Big Disk could produce was with its eSATA connection. The G-RAID mini2 SSD’s slowest connection, USB 2.0, still produced times faster than the LaCie’s best times by finishing our test at 1 minute, 5 seconds. The G-RAID mini2 SSD improved on these scores incrementally with other connections—FireWire 400 finished in 1 minute flat, FireWire 800 finished in 41 seconds, and eSATA finished in 30 seconds. The G-RAID mini2 SSD’s fastest time with the eSATA was four times as fast as the LaCie’s score with the same connection. The G-RAID mini2 SSD offers reliability and speed, though at a high cost per gigabyte. As more companies begin producing drives with this new technology, you can expect prices to come down. Until then, the G-RAID mini2 SSD is hard to recommend to a wider audience, considering its price tag. Early adopters and professionals willing to pay a premium for the latest technology and the peace of mind of solid-state’s high reliability can take comfort in knowing that G-Technology has earned a reputation as a provider of Mac-focused drives with great warranties and sturdy cases. If you’re looking for a portable external RAID and feel that the benefits of an SSD outweigh the drawback of its high price, then the G-RAID SSD line is something worth watching.